At The Sundance® Spa Store Mississauga, we have the perfect Sundance® Hot Tub and Finnleo Sauna to improve your health and activate your lifestyle, all at the very best prices. The Sundance Spa Store in Mississauga, Ontario opened spring 2012 in the Heartland Town Centre. We have been a part of the Mississauga community, selling hot tubs in Mississauga for the past 7 years now and it has been absolutely amazing. We have many wonderful Sundance Hot Tub and Finnleo Sauna customers now and look forward to welcoming many more. Just minutes from the 401, The Sundance Spa Store Mississauga is located across the street from Costco at the intersection of Britannia Road W and Rodeo Drive. Just look for the big Loblaws grocery store and you can't miss us! You're only a few steps away from a healthier lifestyle with our soak (hot tub) and sweat (sauna) packages. We have many Sundance hot tub models on display, both dry and running models for you to see, touch and feel. Take a seat in any of our dry floor models and see how it feels, you will be so comfortable you won't want to get out! Our running display models allow us to show you a Sundance Spa in action and operation. Be prepared to get your hands in the water and experience the incredible hydrotherapy a Sundance Spa delivers. Own a hot tub or a sauna already? We have all your hot tub and sauna supplies and accessories. Bring you hot tub water in anytime for free water testing, we are happy to help! We carry a full line of high quality hot tub products for all your hot tubbing needs. Come visit us today in the Heartland Town Centre in Mississauga Ontario, we look forward to seeing you!
. Plus our ClearRay Water Purification System significantly lowers the amount of chemicals needed to maintain your spa and saves you valuable time and money. Our exclusive ClearRay Water Purification system produces no harmful odors, no chemical, no by-products and no off gases. UV-C light is a reliable water disinfectant also used in the bottling & beverage industry, the food industry, industrial & municipal water plants and the medical industry. ClearRay UV-C is included as standard on all Sundance Spas. 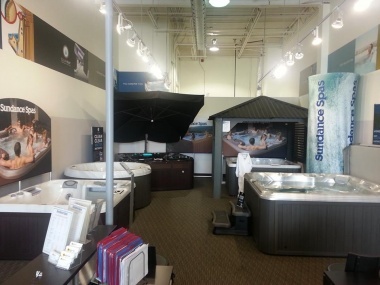 At The Sundance® Spa Store Mississauga, we pride ourselves on selling the very best hot tubs and saunas in the marketplace and backing them up with the best warranties all provided through our professional and dedicated staff.